The Big Apple, the City That Never Sleeps, the Center of the Universe – it transcends definition. It needs no introduction. It is, simply put, New York City. New York City (NYC) has a rich, vibrant history; it’s a world stage for arts and sciences; its economy, ranging from the thousands of small businesses it nurtures to Wall Street and the New York Stock Exchange, influences the world’s. Hundreds of thousands of people move to NYC to further their careers, to pursue higher education, or to revel in its glamorous offerings. However, no matter how long they stay, they’ll probably never learn everything there is to know about the city. 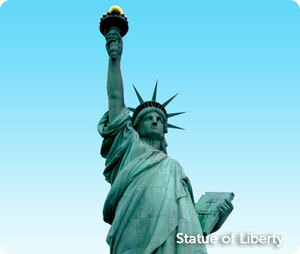 NYC is located in New York state and is situated near the coast of the Atlantic Ocean. Part of the metropolitan area runs along the coast (more technically the edge of the New York Bay); however, the New York skyline (Manhattan) is actually situated on a peninsula that juts out into the Hudson River, which runs into the ocean. NYC is divided into five main “boroughs”: Manhattan, Queens, Brooklyn, the Bronx and Staten Island, each with dozens of their own, smaller neighborhoods. For example, Brooklyn includes the Williamsburg, Park Slope, Bushwick, Red Hook and Cobble Hill neighborhoods, each of which is home to tens of thousands of people. The metropolitan area includes the nearby large cities of New Jersey and Newark and is home to over 22 million people. Iconic Destinations – The Statue of Liberty, the Brooklyn Bridge, and the Empire State Building are just a few of the iconic destinations to be found in New York City. They’re typically great fodder for tourists, but even the “real” New Yorker can appreciate the amazing sites. Take Central Park, for instance. Although it’s a popular tourist spot, people who’ve lived in New York City for most of their lives come here daily to run, walk their pets, and ride their bikes. Food – Top chefs flock to NYC to practice their craft. Here you’ll be able to experience five-star cuisines, the classic American foods, like hot dogs and pizza done right, and all sorts of ethnic dishes from the likes of Chinatown, Little Italy, and even Amish Markets. Public Transit – NYC is the public transit capital of the US. Over 55% of New Yorkers ride public transit, roughly 20% more than in other great public transit cities, like Washington, D.C. and San Francisco. New York offers a dependable and extensive subway system on top of buses and trains. Health and Progressive Policy – New York, more than any other city in the US, or even the world, has taken the punch to obesity, diabetes and other preventable conditions, by trying to make its citizens healthier. Recent soda taxes and calorie information requirements have spearheaded the city’s drive for a healthier populace. Though some may not like its methods, few can argue that New York has its citizens’ health in mind. Weather – NYC is known for cold, snowy winters. Blizzards can choke the city. It’s a good idea to invest in a sturdy pair of rain/snow boots before you move here, especially if you’ll be using public transit. Summers can also be a drag. Many New Yorkers suffer miserably during the hot, humid summers while on public transit or at home, if they’re one of the many without air conditioning. Traffic – The public transit system in NYC is arguably the best in the world. However, look at it like this: there are over 6 million people in New York City alone… even though half of them ride public transit, there are still a lot of people on the roads. The bridges get especially crowded, notably when driving into Manhattan. Plan accordingly. Cost of Living – More than most major cities, the cost of living in NYC is very, very high, side by side with San Francisco as the most expensive place in the nation to live. You’ll probably need to have a roommate situation set up in advance, unless you can afford renting your own place. Also, New York’s progressive policies often come at cost for taxpayers. Ready to move to NY? It’s time to find some New York moving companies, then. We have them right here: NYC movers.